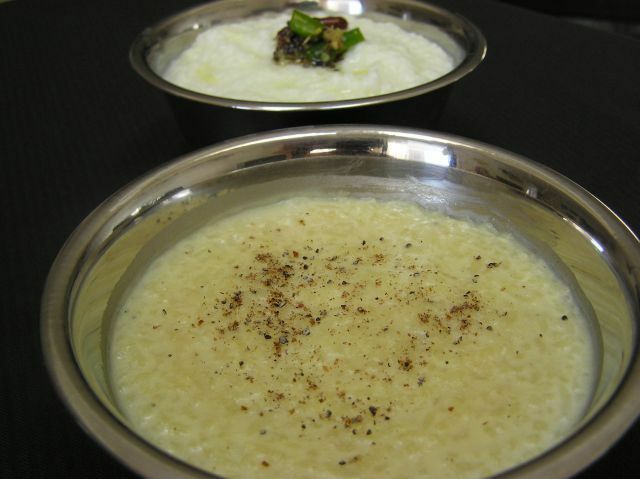 I made two very basic rice recipes, Dhadhojanam (Curd Rice) & Bellam Paravaannam (Rice pudding with jaggery)for CFK-Rice event being hosted by Trupti @ Trupti’s Food Corner. CFK is the brain child of Sharmi @ Neivedyam. Here’s how I made them. I washed, drained and soaked rice (I use Sona masoori rice) in 3 cups of water for about an hour, this will make sure that the rice cooks to a soft consistency. Pressure cook with 2½ - 3 cups of water for 3 whistles (less or more whistles depending on your cooker). Let half rice cool just a little bit. Add yogurt and milk. In a small pan, heat 1tsp oil; when oil’s hot, add mustard seeds, cumin seeds, urad dal (minapappu), red chili, green chili, grated ginger and hing. Once the seeds splutter add to the rice, along with pinch of turmeric and salt to taste. Mix well; let cool before serving. Sometimes I add grated carrots and zucchini to make it more nutritious. Take half the cooked rice in a saucepan, add milk and let it come to a simmer on medium-low flame. When it starts simmering add elaichi powder (cardamom) and badam feast (if using) and simmer for 2-3 minutes. Remove from flame and add jaggery and mix well to incorporate. Since this was for my 18month old I did not add any nuts or raisins.